Over the next few weeks I will recap the 2011 season of each affiliate. This week will focus on the overall season, next week will cover the hitting leaders and the final week will be pitching leaders. Like the week in reviews earlier in the season, each day will bring attention to a different affiliate as we work our way through the franchise. Today we take a look at the overall team stats of the Hudson Valley Renegades. 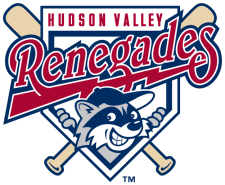 The Hudson Valley Renegades finished the season just two games under .500 with a 37-39 record. They finished the year in third place in the division, 9 1/2 game back. Five Renegades made an appearance in the New York-Penn League All-Star Game; Jeff Malm, Matt Rice, Parker Markel, Robert Dickmann and Charlie Cononie were named to the squad. I got to see the Renegades play a couple times this year and they seemed to be well-managed and play hard in my limited views. Defense was not a strong suit, but some of the pitchers made good strides and overcame many of the mistakes. From the expectations I had heard for this group of players it appears they actually may have overachieved.